There are more than a few Nashville murals that have garnered national recognition. They’re hardly hidden due to the looping lines of guys and gals waiting to have their photo taken in front of them — likely to post to their Instagram page. However, beyond the “I Believe in Nashville” and wings of the city, there are some really neat and new murals hidden around Music City that even locals may not have seen yet. So whether you’re looking to explore a new area of the city, you want to be the first to ‘gram these works of art, or you simply want to snag a photo in front of a unique backdrop, read on for a few of Nashville’s lesser-known murals and street art. Tucked away on California Avenue in The Nations, you’ll find a wall covered in multiple individual murals. Each painted by a different artist, with various themes and styles, they are anchored in the center by a mural that says “We are The Nations.” Representing the inclusive nature of the neighborhood, these were painted by 11 different artists. Nashville-based artist Eric ‘Mobē’ Bass created this beauty over one-and-a-half days on the walls of Music City Tents and Events. Nashville muralist and graffiti artist Folek Kelof created these unifying hands on the “We are The Nations” mural. Emily Elizabeth Miller‘s sweet elephant mural is whimsical and nostalgic. On the side of Green Fleet Bicycle Shop, you’ll find musical greats Stevie Wonder, Etta James, Jimi Hendrix, Marian James and Little Richard biking down the street. These musicians all famously played on Jefferson Street before desegregation and the building of Interstate 40. The playful and uber-cool mural was created by the talented Yusef Hubb (@doughjoe) of Norf Art Collective. Artist @doughjoe frequently features musicians in his creations around town. Located on the side of the now-shuttered Nashville Cash & Carry on Charlotte Avenue, this mural might just be one of our favorites. Each letter is formed out of a few delicious eats – with an homage to Nashville’s Goo Goo Cluster and, of course, some Southern biscuits. Michael Cooper of Murals & More has an incredible eye for detail, and his many murals around town illustrate it. Maybe our favorite of the bunch, this delicious mural on Charlotte Avenue was created by Michael Cooper of Murals & More. We like to think that this ‘S’ is in honor of two of Nashville’s favorite sweets: Christie Cookie Co. and Goo Goo Cluster. ‘E’ is for eat more biscuits … right? Spanning a 1200-foot wall on Charlotte Avenue, Off the Wall Nashville features multiple local artists’ work — each with its own style and message. Bright and colorful and no-doubt eye-catching, the wall of murals set out to contribute to the revitalization of the Charlotte corridor. With messages like “Take Flight” and “It’s Gonna Be OK,” a portrait of Jessi Zazu, a beacon for women’s health activism, as well as some striking abstract designs, the wall brings artistic inspiration to Charlotte Avenue. Nashville’s STERBO created this mural to acknowledge both the railways in Nashville as well as the old-school art of painting on trains. A gentle reminder from Nashville artist Sarah Liz Tate, this creation highlights mental health awareness. On the side of The Centennial, you’ll find a giant portrait of ’80s heartthrob Patrick Swayze painted by Nashville’s I Saw the Sign. With additional paintings of a surfer and large wave, the mural is inspired by the movie Point Break. Take a photo, check out the art and duck inside for dive bar vibes and a delicious burger. Find Patrick Swayze painted on the walls of The Centennial on Centennial Boulevard. This little heart on the side of Vegan Vee has no frills. The symbol for an Instagram ‘like,’ it takes up just one small part of the white wall and provides a plethora of photo options. Ideal, of course, for a post on its namesake platform, hold up a treat from Vegan Vee or have a loved one stand beneath that little heart for a public display of your affection! Artist forBecks has painted these at a few popular stops around town and is also to thank for the Lego figures, popsicles and ice cream cones painted around town. It’s always a delight to spot one of his happy creations. The Instagram heart is just begging to be posted to your feed! One of the newest on the Nashville mural scene, this one was love at first sight. 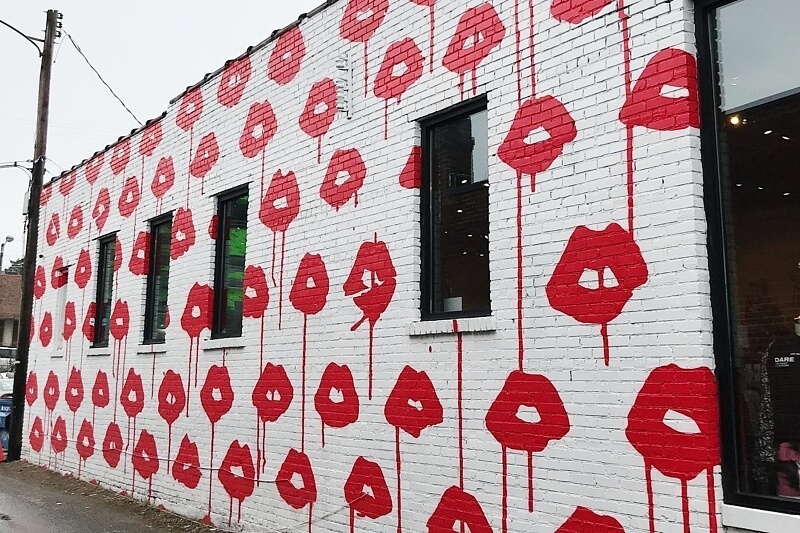 The puckered, dripping red lips by artist Donald Robertson adorn the alley wall of UAL — the new hot spot for photos. Donald, a fashion world favorite artist, was contacted by the UAL team to contribute, and he couldn’t turn down the giant, blank wall. The team at Eastside Murals brought his painting to life, and it’s now a gem in the heart of Hillsboro Village. Donald Robertson and Eastside Murals gave this wall in Hillsboro Village a facelift. In honor of the music that built our city, Wedgehill Market convenience store has a nostalgic cassette tape painted on the side of their building. Created by artist Josh Blevins, the unique mural spans the entire wall and makes use of the windows and other physical features of the building to illustrate the cassette. Wedgehill Market is a convenience store on Benton Avenue with one groovy side. Around the House of Blues studios in Berry Hill, you’ll find many of music’s favorite artists painted on fences in a Wall of Fame. Artist Scott Guion portrays legendary musical talents in multiple spaces in the area. Additionally, the studios are painted with bold patterns and fun designs creating an atmosphere of lightness and fun in the area. Certainly, there are plenty of photo opps in this loop of town! Beloved musicians of all genres are depicted on the fences of Berry Hill. There is no shortage of color on the walls of the House of Blues studios! More musical greats line the streets. East Nashville’s murals range far and wide, but this one on the side of The Cleo has an interactive element. Visitors can “climb inside” the mural by hopping into the basket in front. The hot air balloon mural was the largest of all of Kelsey Montague’s murals last year — so large, in fact, it’s hard to capture it all in just one image! Kelsey is also responsible for the Gulch’s famous wings, and we’re happy she came back to create this beauty at the end of last year. The hot air balloon mural is located in East Nashville and a fun photo opportunity! We love the details atop the mural. Local favorite dive and karaoke bar Santa’s Pub features a fittingly holiday-themed mural on the side of their building. Created by Jacob Burrows, the depiction of Santa and his reindeer at Santa’s Pub — singing, rocking sunglasses and having a jolly old time — is zany and cheerful and perfect for adult kids-at-heart. Good-humored fun is portrayed on the outside of Santa’s Pub! There you have it — a few of our favorite murals in Nashville. Tag us when you visit or the next time you spot a new one! We’re @styleblueprintnville. For more of the best of Nashville – straight to your inbox – subscribe to StyleBlueprint HERE!